A new era has begun. The creator of Formula One, Bernie Ecclestone’s reign is over and there is a new sheriff in town. 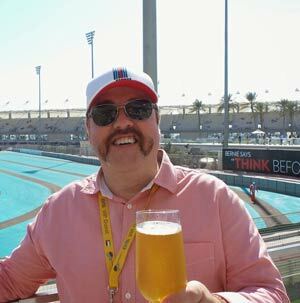 Chase Carey and Liberty Media come with plenty of new ideas; namely how to increase Formula One’s international position as one of the most popular and lucrative sports in the world. How long it will take the ideas that they are implementing to show results is difficult to say, but there already seems to be a new optimism in Formula One this season. And it begins with Ferrari having a faster car, capable of seriously rivalling Mercedes. At last. Last season was primarily a title battle between Mercedes team mates Nico Rosberg and Lewis Hamilton; Rosberg was ultimately victorious (then promptly retired), but the gulf of 124 points between 2nd place Hamilton and 3rd place Ricciardo showed just how much Mercedes were dominating the sport. Hamilton started in pole, so far, so typical. But Vettel had only finished 0.3 seconds behind him in the final qualifying round and Ferrari had performed very well during pre-season testing in Barcelona – so fans were already expecting them to be real contenders this year. Leading from pole, Hamilton was told to speed up to increase the gap before his first pit stop – but he was unable to do so. His desperate need for new tyres forced Hamilton to pit on Lap 17 and he returned to the race 1.7 seconds behind Verstappen. This was a pivotal race moment, not lost on Mercedes engineer Peter Bonnington – “You need to pass Verstappen”, with Hamilton’s reply, “I don’t know how you expect me to do that.” 4 laps later he did, but it was anything but comfortable. Vettel’s pit stop on Lap 23 was better timed and he re-joined in front of Hamilton and Verstappen, then sprinted off ahead, out of sight. When Verstappen pitted 2 laps later, Vettel was nearly 6 seconds up the road, leaving the other drivers incapable of catching him and eventually winning by nearly 10 seconds. Vettel’s first win since Singapore 2015 and his 43rd Formula One victory, he enjoyed a pace and tyre wear advantage over Hamilton throughout the race. A struggling Hamilton’s engine was eventually turned down by Mercedes when they knew he couldn’t catch up with Vettel, allowing new team mate Valtteri Bottas to finish just 1.2 seconds behind him – despite struggling in the first part of the race. Red Bull’s Daniel Ricciardo could not give home fans the performance that he would have hoped for, having what can only be described as a nightmare start to the season. He crashed in qualifying and the necessary repairs included a new gearbox – which resulted in a grid penalty; he then started the race from the pit lane (2 laps in), before his engine failed on Lap 29 putting him out of the race. “It has gone from bad to worse” (Christian Horner). So, what have we gleaned from the first race of 2017? Ferrari are fast; their engine reportedly now better than Mercedes. Toto Wolff said Mercedes faced “a hell of a fight” this season, which for an impartial fan is great news. The ‘Prancing Horse’ have long been a favourite in Formula One, having competed in every season since the competition’s inception and it is heartening to see them finding their form again. There is certainly a new mood emerging. The fact that the leaders of the first race only made one pit stop, would also suggest that the tyre-managing era of the last 6 years could be over. More exciting? Or a problem for some? Shanghai on April 9th is promising a lot..